This article focuses on the Canadian Standards Association (CSA) B651-12, Accessible Design for the Built Environment, and the 2010 Americans with Disabilities Act (ADA) Standards, which describe their respective national standards. Standards are not the same as codes, and most construction industry professionals understand the difference. Codes are considered law and are established by the government, such as the provincial building codes. Standards, on the other hand, are more or less considered guidelines describing established rules or the basis of construction, such as for example the case of washroom accessories. Although there is clearly a significant difference between codes and standards, most designers have long since learned to consider barrier-free standards as being ‘code,’ thus ensuring consistent equal and easy accessibility everywhere for all. While ADA is not mandatory in Canada, it still provides important information to guide design of barrier-free washrooms. Further, at this time, some of the issues covered in this article are not described as thoroughly by the Canadian standard. Consequently, Canadian designers may wish to consider employing ADA as a supplement to CSA B651-12. For example, in regard to projects with barrier-free concerns in Ontario, this author often finds himself referring to the Ontario Building Code (OBC) Accessibility for Ontarians with Disabilities Act (AODA), CSA B651-12, and ADA for necessary information. Under the updated 2010 ADA, Section 604.8.1, wherever toilets are provided, at least one “toilet compartment” shall comply for wheelchair accessibility. 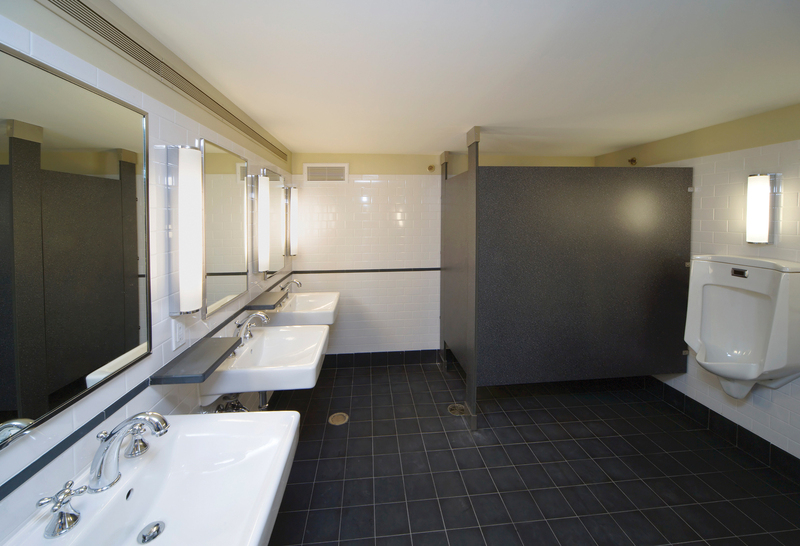 At the same time, CSA B651-12’s Clause 6.2.7.1 describes “accessible toilet stalls.” ADA states one ambulatory stall is required for every six water closets, or combination of urinals and water closets totalling six or more fixtures. Similarly, CSA describes Clause 6.2.7.2 whereby there must be a toilet stall for users with limited mobility. However, there are a few key areas where ADA and CSA differ. 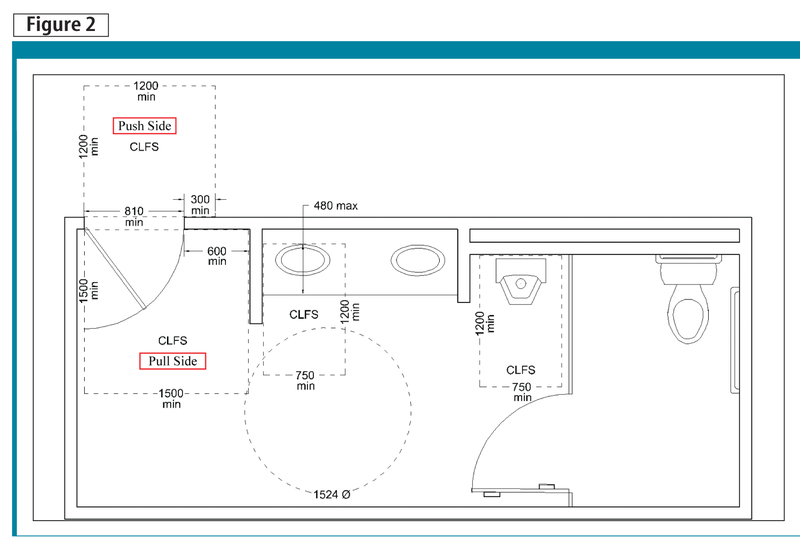 ADA also mandates a minimum of 38 mm of free space below working surface beneath grab bar, permitting easy access for one’s hand to wrap around it, whereas CSA requires designers not to place washroom equipment too close to a grab bar. In any case, depending on jurisdiction, grab bar length and configuration may vary. The diameter of grab bars may also differ. ADA requires 1 ¼ or 1 1/2-in. (i.e. 32 or 38-mm) grab bars, whereas CSA requires grab bars between 30 and 40 mm (i.e. 1 1/5 and 1 3/5 in.) in diameter, with a non-slip continuous gripping, or peened, surface. Both the CSA standard and the U.S. Americans with Disabilities Act (ADA) agree—there should be no sharp or abrasive surfaces beneath lavatories or sinks to protect those approaching in wheelchairs. Grab bars are considered inherently accessible. However, there are standard requirements describing grab bar installation for the purpose of maintaining proper handicapped accessible toilet and shower compartment accessibility, such as length, diameter, gripping surface, installation height, and installation location, without being interfered by other washroom accessories products. Grab bars are expected to withstand a minimum load without collapsing; designers must ensure wall preparation to permit grab bars to withstand expected minimum loading over the building’s life. 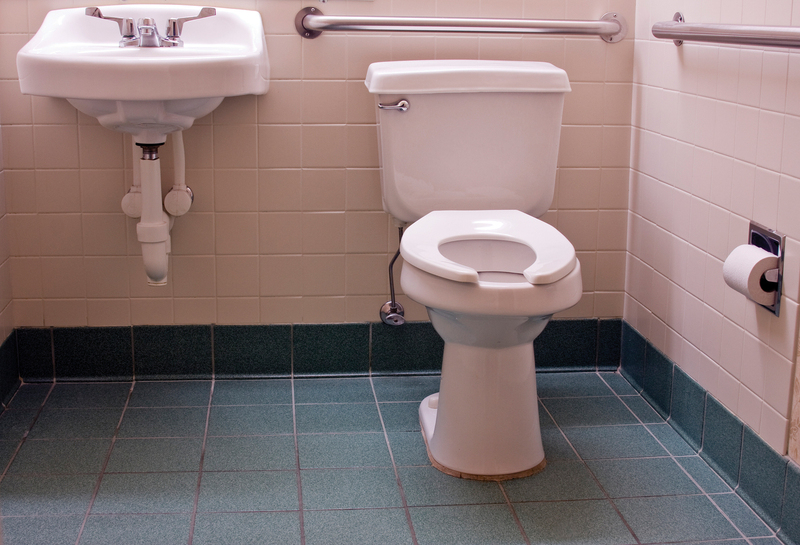 ADA requires water supply, drain pipe, and shutoff valves under lavatories and sinks to be insulated or otherwise designed to protect those in wheelchairs against injury as a result of contact or impact. In this case, CSA agrees with ADA in regard to the fact no sharp or abrasive surfaces must exist beneath lavatories or sinks (Figure 1). Canadian designers should also consider insulating all items under lavatories and sinks to prevent injuries. Clear floor area at the door to a multi-user washroom must satisfy front- or side-approach requirements. Baby change stations are not described by CSA B651-12. However, ADA dictates they must be installed so the maximum height above the finish floor (AFF) does not exceed the deck height (i.e. the flat-bed or horizontal surface of a baby change station once lowered into position). Further complicating the issue, deck height is measured to top-lip of front exposed edge of baby change station and not to the flat-bed surface itself. Some baby change stations have a perimeter lip at the front edge of the unit. Designers should be aware of this, as installers have placed baby change stations with a perimeter lip to the maximum height requirement based on the flat-bed surface—this renders the unit non-compliant due to the fact the top edge of perimeter lip exceeds maximum height restrictions. As mentioned, the deck height is measured to top-lip of front exposed edge of baby change station. ADA defines deck height measured at 860 mm (34 in.) maximum AFF to the top lip of front edge of a baby change station. On the upside, most baby changers meet the ADA requirement because if the unit is installed satisfying the 1200-mm (48-in.) AFF handle pull requirement, then it opens into position to meet the deck height requirement. In regard to toilet fixtures, CSA B651-12 provides guidance, while ADA does not. The Canadian standard includes Clause 6.2.6.1, which requires back support in absence of a toilet seat cover or tank. Generally speaking, backrests are 13-mm (1/2-in.) thick phenolic black-core board 250 mm (10 in.) in length by 100 mm (4 in.) in width over a 25 or 32-mm (1 or 1 ½-in.) diameter stainless steel tubing, and set 200 mm (8 in.) off of the back wall. 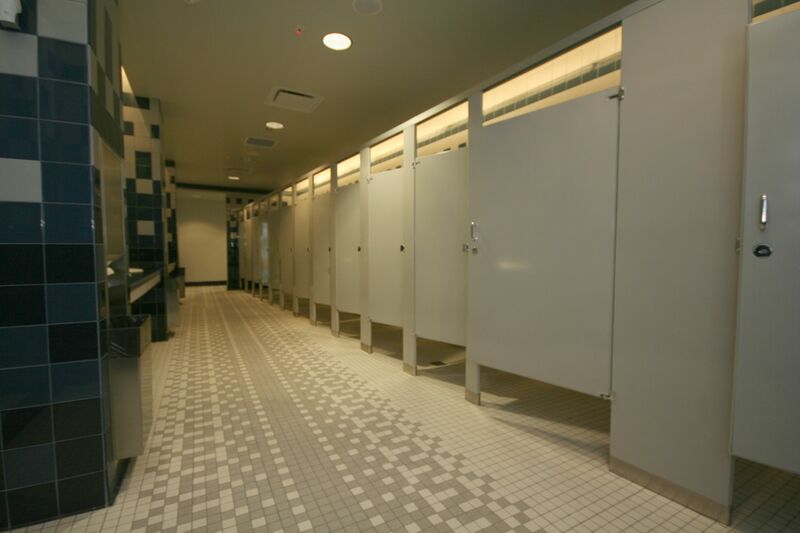 While screens are not required between standard urinals in either CSA B651 or ADA, they are discussed in American National Standards Institute (ANSI) A117.1, Accessible and Usable Buildings and Facilities. Some plumbing professionals believe urinal screens must always be employed between urinals, and not simply in between barrier-free and standard urinals. There is a strong argument suggesting a need for privacy, hygiene, and a better esthetic design, while also providing added comfort in terms of personal space. As in the case of grab bars, urinal screens too are not designed to collapse. Canadian designers must ensure wall preparation to permit urinal screens to withstand expected use, abuse, and vandalism for the duration of a washroom facility’s life. Aside from wall preparation, urinal screens may be designed as wall-mounted alone, wall-mounted and floor-anchored, or wall-mounted and floor-to-ceiling-anchored. 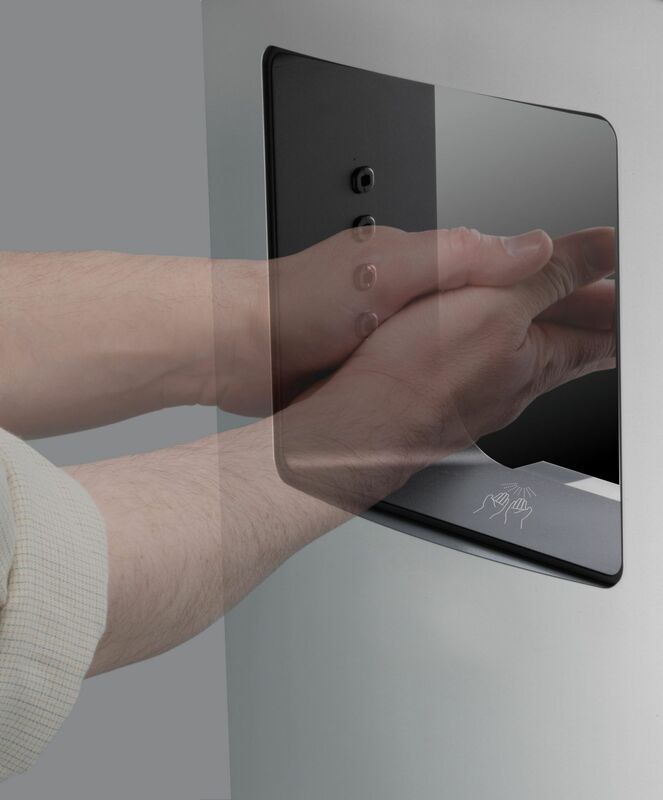 Standard hand dryers for barrier-free applications are 100 mm (4 in.) deep, and can be installed anywhere in a washroom, change room, or locker room. High-speed models require a recess kit, or are available as recessed or semi-recessed units to satisfy accessibility conditions. Designers should learn which products possess high-efficiency particulate air (HEPA) filters, anti-microbial filters, adjustable heaters, and adjustable sound pressure or level reduction. Since CSA standards define accessible design details combined with an extensive variety of fixtures and washroom equipment, which types of products, features, and placement tips do Canadian designers need to create CSA-compliant multi-user washrooms? There are 10 additional key CSA considerations to incorporate into Canadian barrier-free washroom design. CSA standards mandate minimum clear width, or finish-to-finish surface, must be maintained throughout an accessible route permitting a disabled person access to spaces without having to weave in and out. Clear width of accessible routes must have a minimum of 920 mm (36 in. 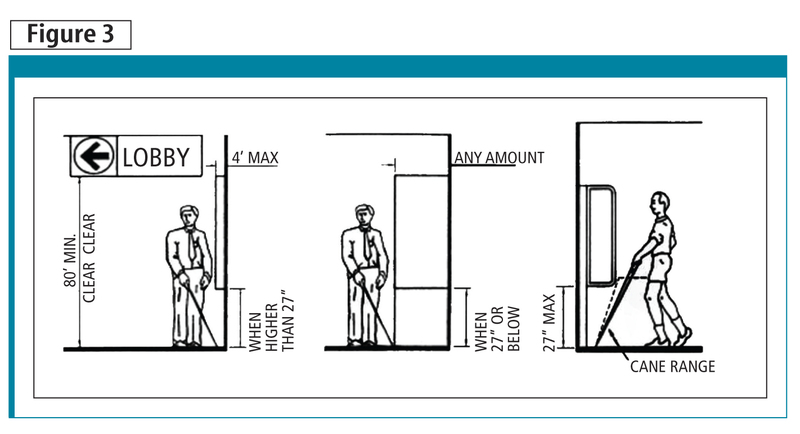 ), whereas clear width of door openings at vestibules and passage ways through walls must provide a minimum of 810-mm (32 in.) clear space. Swing doors have to provide 810 mm minimum at openings, taking into account size of the door frame, space used by hinges, door width, and a full 90-degree swing. Accessible routes reign supreme throughout a multi-user washroom, to the last applicable washroom fixture. As discussed, accessible routes must maintain a minimum width of 920 mm. With this in mind, designers must be aware of protruding object issues to avoid washroom equipment overlapping into accessible routes. Clear floor area at the door to a multi-user washroom must satisfy front- or side-approach requirements. In regard to the former, CSA requires 1200 x 1200-mm (47 x 47-in.) clear floor area on the door’s push side, and 1500 x 1500-mm (59 x 59-in.) on its pull side. Washroom accessories also require enough clear floor area to permit wheelchair-users easy access. The minimum wheelchair clear floor area is 750 x 1200 mm (30 x 47 in.). Since the clear floor area on the multi-user washroom door’s pull side must remain unobstructed, one should refrain from placing washroom accessories or other components in this location. Further, since accessible routes must always remain free, designers should be wary of any washroom accessories equipment clear floor area overlaps, accessories folding open, into the pull-side door’s clear floor area. Similarly, when an electrical- or mechanical-component clear floor area overlaps into that of the door’s pull side, accessible routes may again become restricted. To avoid conflicts with accessible routes, the designer may wish to consider moving washroom accessories, equipment, and electrical/mechanical components to a suitable location away from the pull-side door clear floor area. 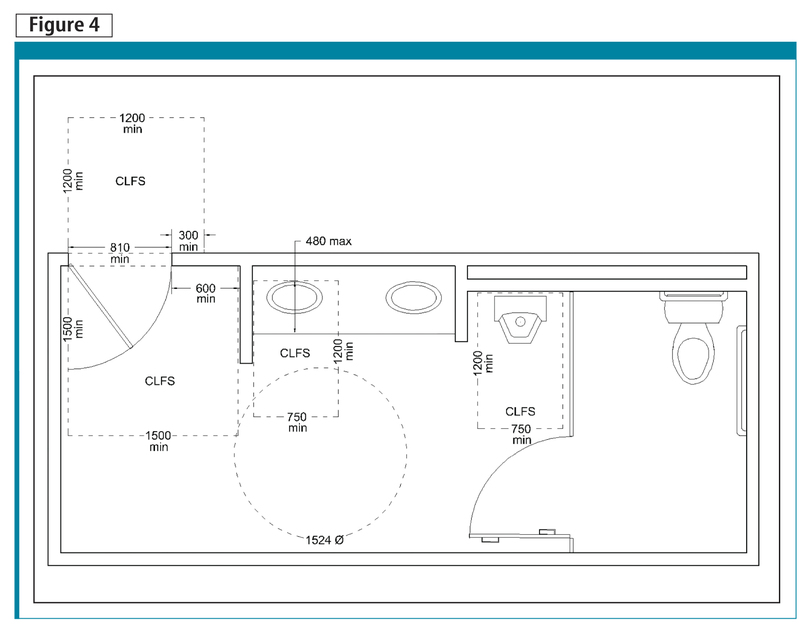 The aforementioned 750 x 1200-mm wheelchair clear floor area is also required in regard to front or side approach of lavatories and sinks, as well as front approach of urinals. When pilasters are designed to support urinal screens, then the front-approach clear floor area of 750 mm between urinal screens will be restricted to the space between pilasters. Similarly, if a pilaster is designed to support a single urinal screen parallel to a wall or partition panel, then the front-approach clear floor area will be restricted to space between pilaster to panel or wall. If two urinal screens exist, with pilaster support, the required 750 mm minimum space should be between the pilasters and not the urinal screens (Figure 2). Objects mounted on columns, walls, or freestanding supports less than 2030 mm (80 in.) AFF cannot protrude beyond 100 mm (4 in.) horizontally outward from the wall, or smooth vertical surface, into the room or accessible route. There are, however, exceptions for cane-detectable objects at, or below, 680 mm (27 in.) AFF to leading edge (i.e. underside of front edge of object). In other words, in the case of objects mounted below 2030 mm AFF, when a display case, cubbies, or telephone enclosure is installed 680 mm maximum AFF to the leading edge, then there is no protruding object issue. Having said that, the lion’s share of typical washroom accessories equipment are designed, specified, and installed at heights greater than 680 mm AFF to the leading edge. To avoid this issue entirely, designers may wish to consider specifying barrier-free washroom equipment (i.e. those not protruding beyond 100 mm horizontally outward). 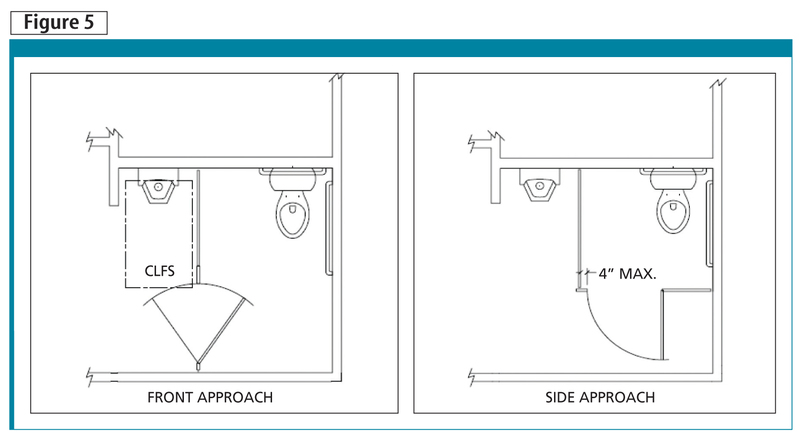 Alternatively, designers may wish to provide sufficient wall space to at least permit semi-recessing of washroom accessories equipment (Figure 3). Those using wheelchairs need to be able to reach the operable components of washroom accessories equipment, along with light switches, thermostats, or the back of shelves. CSA standards regarding both front- and side-reach height is a maximum of 1200 mm (47 in.) AFF. Front- and side-reach height for purposes of grasping up to 500 mm (20 in.) over an obstacle or obstruction is, respectively, 1100 mm (43 in.) and 1200 mm. Designers may wish to consider specifying, for example, feminine napkin and tampon dispensers at 1200 mm AFF to coin slot (which is the operable component). Most designers are familiar with the current CSA standard’s ‘turning circle’ requirement of 1500 mm (59 in.). Nevertheless, one should also refer to local jurisdictional standards, as some municipalities have elected for an 1830- or 2440-mm (72- or 96-in.) turning circle. 810 to 860-mm (32 to 34-in.) vertical measurement AFF to upper portion of front edge of sink, or counter. One should also consider 1000-mm (39-in.) AFF to the top edge of the bottom frame of a mirror over lavatory or sink (measured AFF to lowest edge of reflective part of mirror). Objects mounted on columns, walls, or freestanding supports less than 2030 mm (80 in.) above the finished fl oor (AFF) cannot protrude beyond 100 mm (4 in.) horizontally from the wall into the accessible route. There are exceptions for cane-detectable objects. Regarding compartment doors relating to change rooms, showers, and toilet partitions, CSA’s minimum requirement for handicap-accessible doors is 810 mm (32 in.). However, CSA’s accessible route is 920 mm (36 in. ), ADA’s path of travel is 915 mm (36 in. ), and wheelchairs are available in larger sizes compared to minimum clear floor space of 750 x 1200 mm (30 x 47 in.). This means designers may be better off providing 915-mm barrier-free compartment doors on all future projects. While these doors are larger than compartment doors currently specified by most designers, they are expected to become the industry standard in the future (Figure 4). In regard to toilet compartments, partition doors must be located on a diagonal opposite the W/C. This requirement, coupled with front approach, permits a person in a wheelchair to easily drive forward into the accessible compartment, and reverse into a position adjacent to the W/C. Front approach dictates 1500 x 1500-mm (59 x 59-in.) clear floor area for a person in a wheelchair to access pull-side change room, shower room, or toilet compartments. In terms of a side approach, people in wheelchairs require additional manoeuvring to access the position next to W/C. CSA requires a side approach to compartment doors to be considered as entry through doors in general. Having said that, assuming side approach is achieved from latch side of door, one requires a 1200-mm (47-in.) wide passage to access a handicap-accessible change room, shower, or toilet compartment (Figure 5). Accessible components must remain accessible to all. Tight grasping, pinching, or twisting is not permitted anywhere in a building (with exception to maintenance and security concerns). So, with this in mind, the physically challenged, or those with limited dexterity, employ their fists as a paddle to access washroom accessories equipment and fixtures. To satisfy requirements, designers may wish to consider hands-free, D-type pull handles, slide latches, and levered handles as a means to access washroom equipment, compartments, and fixtures. Levered handles must meet 22.2 N (5 lb) force maximum requirement to satisfy barrier-free concerns. In this way, everyone may access washroom accessories and fixtures, along with change room, shower, and toilet compartments, with relative ease. As mentioned, CSA currently does not describe baby change stations. As an alternative, designers may wish to consider the ADA information discussed earlier in this article. The baby change stations should have pull-handle heights located at a maximum of 1200 mm (47 in.) AFF, in conjunction with deck height range of 710 to 860 mm (28 to 34 in.) AFF to top of the front lip of a baby change station. All washroom accessories must be thought of in terms of accessibility. In the case of handicap-accessible toilet compartments, designers must remember some washroom accessories require a minimum clear floor area of 750 x 1200 mm (30 to 47 in. ), and other accessories must be accessible from a W/C—as discussed, this enables a person in a wheelchair to access washroom accessories as required with relative ease. However, designers must take care to consider the order in which some required washroom accessories are accessed by a person prior to transferring from a wheelchair onto a W/C. For example, a person in a wheelchair will require a toilet seat cover before transferring onto a W/C; the toilet seat cover dispenser will require minimum clear floor area to permit person in a wheelchair to access toilet seat cover prior to transferring onto a W/C. In terms of a side approach, people in wheelchairs require additional manoeuvring to access the position next to the toilet. The CSA standard requires a side approach to compartment doors to be considered as entry through doors in general. With regard to combination units, whether partition- or wall-mounted, designers may combine up to six essential washroom accessories elements into a single compact combination unit. The idea behind combination units is to maximize clear floor area and to permit ease of servicing. With respect to handicapped-accessible toilet compartments, the mounting heights of combination units must be carefully considered to avoid conflicts with placement of the grab bars. assurance accessible routes are unrestricted and free of protruding objects. 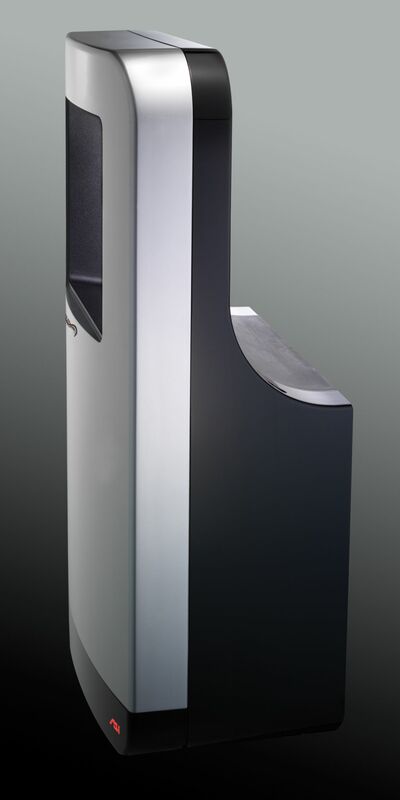 Regarding hand dryers, many manufacturers produce high-efficiency regular, high-speed, and ‘blade-type’ models. Hand dryers have grown enormously in popularity over the past decade. The combination of better design, excellent performance, and higher efficiency has driven the market forward, along with cost-effectiveness, practicality, and cleanliness. 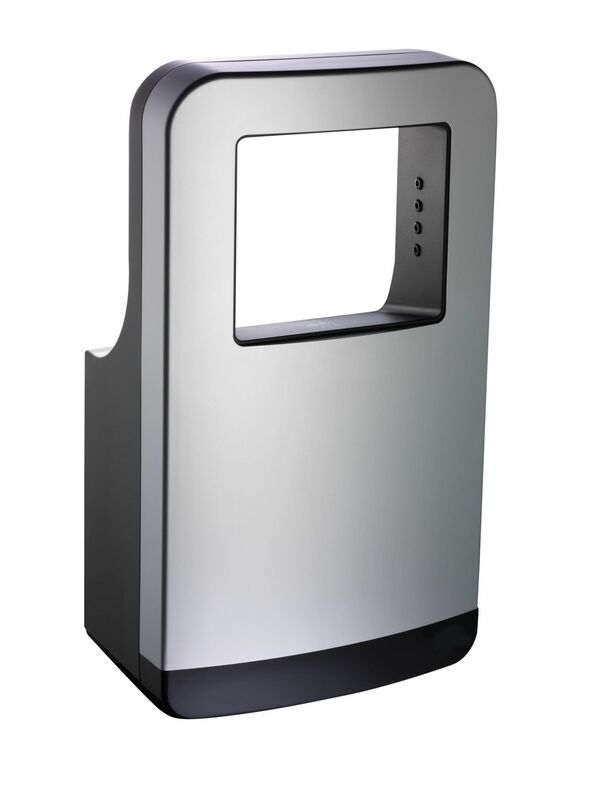 Standard hand dryers for barrier-free applications are 100 mm (4 in.) deep, and can be installed anywhere in a washroom, change room, or locker room. High-speed models require a recess kit, or are available as recessed or semi-recessed units to satisfy accessibility conditions. Designers must review each product’s technical data sheet to be aware whether it possesses key adjustable features such as heaters, filters, and sound pressure or level reduction. For blade hand dryers that are wall-mounted to meet barrier-free requirements, designers should review the manufacturer’s literature to learn which products possess new features such as high-efficiency particulate air (HEPA) filters, anti-microbial filters, adjustable heaters, and adjustable sound pressure or level reduction. Various restroom/change room equipment and furnishings need to be considered from a universal access mindset in terms of placement. Examples include Z-pattern phenolic lockers (left), standard recessed waste receptacles (above), recessed paper towel dispensers (right), and standard L-shaped (left or right side) phenolic shower stall seats (far right). For typical Canadian locker design, designers must be aware of related issues beyond the fact a certain number of lockers must be available for barrier-free individuals per project, and that individuals in wheelchairs can access locker doors. It is also of critical importance to consider reach distance and height; it is not enough to know people in wheelchairs may access a locker door, but it is of vital importance for people in wheelchairs to be able to reach shelves inside a locker. With this in mind, Canadian designers may wish to consult ADA, as CSA does not describe lockers. Designers must consider front or side approach in regard to those in wheelchairs reaching into a locker. In terms of side approach, ADA requires 1370 mm (54 in.) maximum height to reach top shelf (CSA suggests maximum side reach height, without an obstruction, of 1400 mm [55 in. ]), and 230 mm (9 in.) maximum height to reach bottom shelf. Regarding front approach, ADA requires 1200 mm (47 in.) maximum to reach top shelf, and 380 mm (15 in.) maximum to reach the bottom one. Additionally, to meet ADA requirements, locker handles are to be installed at 965 mm (38 in.) maximum height AFF to permit those in wheelchairs to reach the hasp—the heavy-duty metal component through which combination locks thread to secure the locker door. Additionally, one should specify such locker doors to include barrier-free-compliant handles. CSA B651-12, Accessible Design for the Built Environment, is an excellent source of barrier-free information for Canadian architects and designers. Having said that, Canadian architects and designers may wish to reference ADA as a supplement in areas where CSA does not describe barrier-free solution, while also bearing in mind national, provincial, municipal, and local jurisdictional codes and regulations. Designers may wish to consider location and associated height of washroom accessories within a multi-user washroom, as well as the order in which users require to access washroom accessories in general. Careful thought and consideration of washroom accessories placement will produce ease of access and use for all. Similarly, location of hand dryers, lockers, benches, and urinal screens, along with toilet, change room, and shower partitions must be considered carefully to permit equal and easy access for all. Finally, designers may wish to brace themselves regarding future developments such as the need for additional building space to accommodate motorized scooters. Some Canadian municipalities have elected for an 1830 or 2440 mm (72 or 96 in.) turning circle. 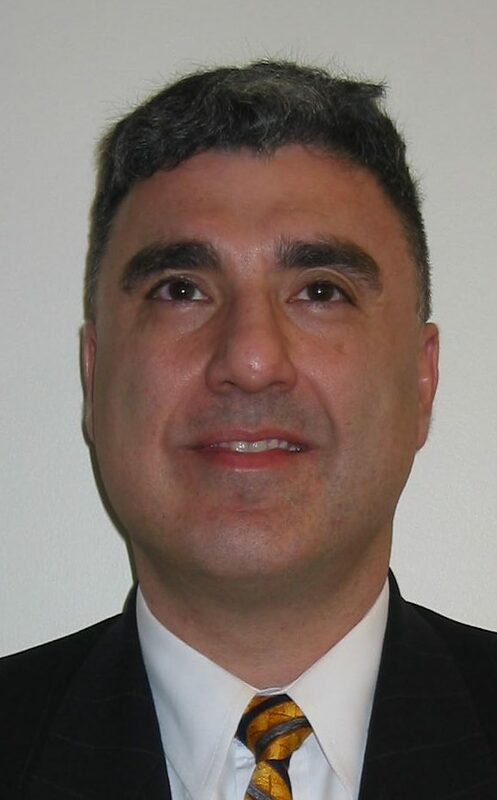 Steven C. Ioannides, B.Eng., CTR, CSP, LEED AP, is an architectural representative with ASI Group–Watrous Inc. He has a degree in civil engineering, and worked in the foundations engineering industry for several years. Ioannides entered the building products industry in 2003, as an architectural sales representative and soon joined Construction Specifications Canada, earning his Certified Technical Representative (CTR) designation. He joined the CSC Toronto Chapter executive council, editing the Specifier newsletter for several years; he currently serves as student liaison officer. 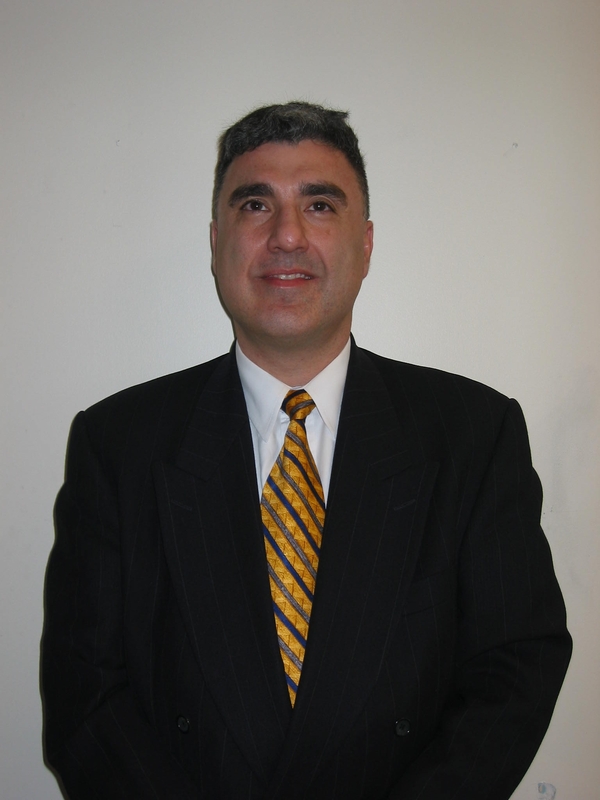 Last year, Ioannides earned his Certified Specification Practitioner (CSP) designation. He can be reached at sioannides@asiwatrous.com.